We are now three months into the season and we are still awaiting a sight of our new defensive midfielder. Sapporo tried to fob us off with Danilson, but the Columbian forward has yet to settle into the team and clearly has no idea of how to play the anchor role. His height and strength looked as though they would be an asset, but the club has been proved right in rejecting the Hokkaido team's optimistic 500 million yen transfer fee. Stojkovic should cut his losses, and start using the 1.85 metre Dani in a more attacking role. Leave the defensive midfield duties to the twin terriers, Naoshi and Keiji. Missing its four internationals, an experimental lineup (with talented midfield youngster Sho Hanai thrown in at centre back) was no match for the Orange Squirrels. Three first half goals, by Kanazawa and a brace from Rafael, proved more then enough for the visitors to earn their first win of this year's Nabisco Cup. The home team crashed to its fourth loss in a row to a likely title contender. Clearly, our simple tactics are posing no problem for the better teams, and manager Stojkovic will have to come up with some new ideas if the team is to finish above them. Despite dominating possession 61% to 29%, we went in at half time trailing 0-1 and had seen Alex forced to retire after only 17 minutes in. Although Josh bagged his eighth goal of the season at the start of the second, with a left foot strike from 10 yards, Koroki restored the visitors lead almost immediately. Marguinhos and Motoyama then added to the misery, with goals against the run of play as we chased the game. 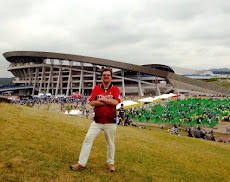 Peter reports in on Shinji Kagawa's farewell game at Nagai Stadium. A vital win for the home team since they will not have their leading scorer when the league resumes in July. The better side won, but Cerezo were far from their best--Kim had his worst game this season and there were more misplaced passes than usual. Vissel were up for this derby game, and there was never any danger that last week's record of a yellow cardless game would be repeated. Vissel must take some credit for Cerezo's misplaced passes as they pressured Cerezo pretty well, but Cerezo stood up well to their bullying tactics and survived Okubo's diving. In all there were nine yellow cards: Moniwa, Uemoto, Omata and Kagawa (Cerezo) and Popo, Tokura, Botti, Miyamoto and Okubo (Vissel) (Okubo got his card after the final whistle for dissent, presumably for protesting that some Cerezo player wasn't sent off -- he's now really in for trying to get opponents sent off). Uemoto's card was also for dissent, protesting Moniwa's card--both of those in just the 8th minute. Botti's card was for standing in front of the ball at a Cerezo free-kick. After that, although Inui (twice) and Amaral shot wide, Cerezo had no shots on target in regular time in the first half, despite playing quite a lot of their hallmark possession football. But the six minutes of injury time were a different kettle of fish. In the 47th minute, Takahashi did a good bit of work out wide right to gain possession, slipped the ball inside to Ienaga, went off on a run, took a smart pass back from Ienaga, and got in a fast low centre across goal; Kishi failed to come out and Bando's diving header at the bouncing ball saw it nestle in the corner of the net to Kishi's right. Official time 45'+3. In the 49th minute Tokura brought Amaral down from behind about five metres outside the Vissel penalty area in the centre slightly to Cerezo's right. By the time the free-kick was taken it was the sixth minute of four minutes added time. Kagawa lifted the ball up over the wall and down under the bar right into the far corner; the ball was not just inside the far post, and you couldn't help wondering whether Vissel goalie Kishi shouldn't have got to it; but a beautiful free-kick for Kagawa to say a nice sayonara to Nagai. Official time: 45'+6. The half-time whistle followed immediately. 2-1. As you can see by comparing the Match stats below with the half-time stats above, the second-half was feisty. Vissel went for the equaliser and Cerezo went for a third goal to put the game to bed. Vissel managed to end Cerezo's dominance of the possession, but in the second half Cerezo outshot Vissel 15-3; there's a symbiotic relationship between those two stats--instead of playing possession football, in the second half Cerezo were shooting for that vital third goal, and thus often returning possession to Vissel: in this half Vissel had 13 goal-kicks to Cerezo's 3. Cerezo's propensity, not only in this game, to play possession football or shoot, one or the other, can be seen from the fact that they had only two corner-kicks in the whole game. But the vital statistics in this half were the 29 fouls--18 by Vissel and 11 by Cerezo--and the six yellow cards (including Okubo's post-final whistle rant). In contrast to the pallyness in the tunnel before the game, the second-half was a scrappy, bad-tempered affair. There were several near misses but no goals. For Vissel, in general I thought Kishi looked a reasonably useful goalie for his age, and Tokura too seems a promising player and has a very positive approach. Okubo has become a poor man's Totti--bags of talent, but too much gamesmanship. Since Martinez was injured, there has been a tendency for all Cerezo's moves to flow through Kagawa. Now he is off to Dortmund, it is very much to be hoped by Cerezo supporters that Martinez is fit for July 14. Of course, there may be new signings but, if not, the prospect of Cerezo taking the field with neither Martinez nor Kagawa is worrying. Amaral has improved steadily and is now a strong player, but he is nowhere near as cultured as Martinez. One thing is for sure, Ienaga will be an important player--let's hope he can keep his vision and technical skill and get rid of his selfishness in front of goal; if he does, he can become a key player and a star. Japan Lambs Headed for a Slaughter? Takeshi Okada has made his predictable choices for Japan's squad for South Africa 2010. Get the mint sauce ready, because this bunch will soon be roast lamb. Where were the bold, if rash, choices of his last World Cup failure at France '98, which saw him drop Kazu and take Shinji Ono instead. OK, he will get full marks from the ladies for adding former heartthrob Kawaguchi, rather than Sanfrecce's Nishikawa, as one of the goalies, but otherwise these are the same uninspired choices we have seen for game after disastrous game recently. From a Grampus viewpoint, it is equally predictable, with all our key Japanese players making the squad. (Mu Kanazaki might have been a surprise choice, but suffered an unfortunately timed injury last week.) Tulio and Narazaki are among the few choices that fully deserve their selection, alongside Okazaki, Endo and Shunsuke Nakamura. Tamada is a safe choice, even if he has not been setting the J.League alight with his goals. He has proven he can hit the mark on the world stage and has been a vital player for Nagoya as the link between the midfield and Aussie striker Josh Kennedy. However, Japan's best hope of advancing from the group stages lie in the feet of former Grampus midfield maestro Keisuke Honda. The CSKA player needs to prove that he can fit in with the other players, especially Nakamura, but that seems to be the only hope of the manager avoiding another embarrassing World Cup exit. Alan beats us to the punch and gives us his rundown of Oka-chan's squad for South Africa. Kisho Yano (Albirex Niigata, 26, 17, 2). Vissel cruised a comfortable home win against likely relegation rivals Jubilo. Statistically, this was a dead heat, but with both Botti and Okubo in inspired form, the visitors were well beaten. The home team was clearly in a different class to a very poor opponent. Meanwhile in Yamanashi, Grampus coach Dido's beanpole of a son, Mike, did for Vortis, bagging his third goal of the season, but not with his head. A Josh Kennedy double sees the away team leave it until the last minute again, but they secure a vital win to rise to second in the table. With both Urawa and Shimizu losing yesterday, they are now firmly back in the title hunt. This despite Keiji Tamada being ruled out for this and next weekend's clash against the Antlers and Magnum and his frail hamstring only lasting for nine minutes. Meanwhile, the Aussie striker's brace now makes him the leading scorer in the league. The first, from the penalty spot, took him level with four joint leaders, and the second (a typically powerful header) takes him to seven goals from his nine appearances this season. The J.League official site has a brief outline of Vortis and their stadium in English, but we aim to add some additional information. Cerezo Pete is back again with his take on his team's surprisingly comfortable win over Kashima the other day. OK, they need some help from Sogahata for both goals, but they were worthy winners of this contest. In his post-match comments, Cerezo manager Culpi stated that this was a game that both sides tried to win, and it made for a very open game. I’m sure he was right, but you have to say, in that case, Cerezo played it very cool against the reigning champions. Especially in the first half, Cerezo played a lot of possession football, almost as though they had a lead and were playing out time; obviously, it was Culpi’s intention not to repeat the mistake against Nagoya Grampus and allow Kashima Antlers too much possession. Against this, the Antlers seemed to be lacking a little energy after their exertions in the Asian Champions League on April 28 and in J1 away at Yokohama F Marinos on April 24 and at home to Gamba Osaka on May 1. The consequence was that the game between newly promoted Cerezo and champions the Antlers was a very even one, with, for once, the breaks and the better finishing going Cerezo’s way. Cerezo also had Kim in goal. Cerezo started playing a lot of possession football as though they would be happy with a 0-0 draw, and perhaps they would not have been too disappointed if it had ended that way. But waiting patiently for their chances, Cerezo gradually grew in confidence as they realized they would not be outplayed by the Antlers. Perhaps that was part of Culpi’s plan. The result was that the only meaningful Cerezo attempt on goal until the 26th minute was an Amaral free-kick along the ground blocked by the wall in the 10th. At this point in the game Cerezo were dominating possession so the Antlers too find chances hard to come by, although in the 4th minute Koroki was only narrowly wide with a right-foot shot. In the 16th a tall Antlers player, I think Jung-Soo Lee, nearly scored as he got behind the Cerezo defence from an Ogasawara free kick on the Antlers' left but only managed to touch the ball with his hair, and Cerezo were awarded a goal kick. In the 19th Nozawa tried a speculative left-foot shot in the right channel from about 40 metres that was only just over the bar near Kim's left-hand post, but probably the keeper had it covered. Also from the right channel, in the 20th Ogasawara was a little bit further over and slightly wide of the same corner with his right foot from about 25 metres. In the 28th Cerezo nearly scored as, following some neat football between Kagawa and Inui, Ienaga was found in space on the right; his beautiful hanging cross was challenged for by Adriano and Antlers' goalie Sogahata, with the ball going straight up in the air, and when it came down the incoming Kagawa and defender Iwamasa went for the ball with Kagawa getting in a header that bobbled towards the goal but Iwamasa managed to clear it off the line, although the ref belatedly blew for a free kick to the Antlers for Adriano's challenge on Sogahata which had resulted in Adriano getting a punch above the eye and Sogahata going down. It took Adriano a minute or two to recover from that punch. Soon after the resulting short free-kick, Amaral got in to intercept the ball but shot well wide with his right foot from about 40 metres. On 42 minutes the Brazilian midfielder tried another hopeful right-foot shot from about 25 metres which went well wide of Sogahata's right post, when, perhaps, Amaral had better options. On 45 minutes Inui found Adriano out on the left level with the edge of the penalty area and he came in, beat a defender and got in a right-foot shot which was comfortably saved by Sogahata. 0-0 at half-time--rather a Brazilian affair with lots of probing by both sides, but not many clear-cut goalscoring opportunities; apart from Kagawa's header after the ref had blown for a free-kick, I counted six attempts on goal--three for the Antlers from the 4th to the 20th minute and three to Cerezo between the 29th and 45th. In the 47th minute Ienaga had a terrific dribble after which he got in a left-foot shot from the right channel which was not so far wide of Sogahata's right-hand post. In the 44th the Antlers had a superb multiple-passes move which ended with a cross from the right that was headed out for a corner by a Cerezo defender. From this corner, Cerezo had a let-off as Kim flapped and Lee headed over the open goal in the 50th minute. In the 53rd, after a brilliant throw-out by Kim and a neat one-two between Kagawa and Ienaga, Ienaga finished with a weak left-shot straight at the goalie from the edge of the box. In the 56th minute a powerful right-foot free-kick by Amaral from the right channel brought a good save from Sogahata diving to his left. Two minutes later Amaral tried another optimistic 40-metre shot which sailed well over the bar. The 60th minute saw a superb save by Kim from a looping Koroki header. Less than a minute later Nozawa saw another left-foot shot straight in front of the goal just clear the bar after he took one touch from a headed clearance by a Cerezo defender. Soon after Adriano was limping after a challenge with an Antlers defender for the ball about one metre in front of the junction of the six-yard box and the goal line. A minute later, for the Antlers Nakata was substituted by Aoki. In the 63rd, after a beautiful cross from Takahashi from Cerezo's right, Inui glanced just wide of the far post. A minute after that, Komatsu came on as a substitute for Adriano. In the 64th, after a clever one-two down the Antlers right, Araiba got in a brilliant cross which was hit by Kuroki with his shin about a metre out from goal bringing a point-blank save by Kim. Kim then rolled the ball out to Inui and from the resulting attack Cerezo took the lead. Cerezo had a good passing movement intercepted by Felype Gabriel stretching with his leg but the ball bounced back to Inui who fed Kagawa unmarked out on the left. The Antlers defence seemed to be concentrating on trying to catch Ienaga offside. Kagawa came into the penalty area dummied his man and curled a lovely curling right-foot shot from 13 metres just inside the far post--almost a video replay of his winning goal against Bellmare. Five minutes later Felype Gabriel made way for the young Yasushi Endo. Two minutes after that, after a good move down the Antlers' left and a precise cross, Marquinhos got in a strong header that was brilliantly parried by Kim, but Nozawa following up was able to bang the ball into the net with his left foot from three metres. In the 77th minute, Sogahata rolled a ball out towards Nozawa, but Ogasawara also moved in and Nozawa left it for him, but Amaral nipped in from behind Ogasawara, intercepted the ball, took one touche and banged it low into the right corner of Sogahata's net while the goalie was still off balance. In the 82nd minute Culpi replaced Inui with Kiyotake and in the 84th Koroki was out for the Antlers and the 19-year-old striker Osako was in. However, after their second goal Cerezo closed the game down and, although the Antlers pressed, clear-cut chances were almost non-existent, with the only shot on goal coming from Marquinhos on the edge of the penalty area in the 88th minute, but this was blocked by a Cerezo defender only about five metres, if that, in front of the Antlers' striker. For most of the last two minutes of injury time Kagawa and Ienaga did a terrific job of keeping possession in the Antlers' corners and when an Antlers player eventually got a foot on the ball it went straight to Amaral, who tried yet another long shot which went well wide of Sogahata's right-hand post thus returning possession to the Antlers. But by that time only twenty seconds were remaining. One outstanding statistic of this game was that there were no yellow cards. Perhaps players were on their best behaviour in front of Japan national team manager Okada. Perhaps Cerezo were willing to play patiently and perhaps the Antlers were a little fatigued; certainly, after Cerezo went ahead for the second time, the Antlers seemed to lack the energy to make a final assault on the Cerezo penalty area. Despite this slight lack of intensity, the spectators were treated to a fine display of Brazilian soccer from both sides. The battle of the likely relegation candidates predictably ended in a stalemate. The only good news for Vissel fans is that Tokura looks like he is adjusting to life in J1 and the fact that the upcoming World Cup break will likely see a long-overdue end to the Miura era. The former Grampus combination of Aoyama and Tsuda help the home team give their home fans in Naruto reason to cheer after a couple of poor home games. The team exploding for four second half goals after a closely fought opening 45 minutes. As reported earlier, Cerezo won fairly comfortably against a very disappointing Kashima. Teruyuki Moniwa proving to be far too good a defender for the mismatched Koroki. Although former Japan striker Yanagisawa bagged the 100th goal of his career, with a well-taken chance, the Purples were no match for the Shimizu bandwagon and were duly crushed under its wheels as four second half goals cancelled out the home team's 2-0 half time lead. The two championship hopefuls played out a high-scoring game that saw the home team blow a 3-1 lead with 20 minutes to go. Although we played reasonably well in the first half, and Josh Kennedy could easily have added to his one goal, we were eventually beaten by the fitter and more industrious Reds. This means that apart from the opening day win over Gamba, we have lost the three big games against likely title contenders: 2-3 vs Frontale, 0-1 vs Sanfrecce and now 1-2 against Urawa. Hardly the form of champions, even if we are managing to get results against the other teams. This is an improvement over last year, but it looks like we are still a player or two short of winning the title. Of course, if the disappointing Ogawa regains his form then we could easily rise again, but the games against the Antlers and S-Pulse now look like deciding the course of the season. Igor Burzanovic started the game looking more comfortable in his midfield role. Both teams quick to close down opponent near the box. Grampus had the better of he opening exchanges. Yamagishi forced to tip over Kennedy’s header from a Santos corner. One neat move between Ogawa and Kennedy almost sent the midfielder through, but a last ditch challenge averted the danger. Ogawa then missed a quilt-edged chance after intercepting a pass deep in the Urawa half. Regrettably, he put the effort the wrong side of the post. Kennedy duly gave us a deserved lead shortly after this, his flicked header turning in Alex’s deep cross. Urawa gradually started to get into the game and started to look the more threatening from about midway through the half. Kashiwagi and Tanaka both going close with efforts. Urawa’s injury-prone, but lively, forward was hurt in an arial clash with Chiyotanda. Surprisingly, this lead to the home team looking the shaper once Haraguchi came on. As the half came to a close, Narazaki was forced to make a smart save low to his right from an Edmilson shot from a tight angle. The half saw Urawa continue the improvement they had showed towrds the end of the first, and were soon back on level terms. Haraguchi picking up a loose ball near the edge of the box and laying the ball off for Kashiwagi to blast home from 18 yards. The home team now settled into its rhythm and its slick passing and quick movement was to pose a constant problem for us over the remaining 40 minutes. However, it was clumsy error, of Masukawa proportions, by Chiyotanda that led to the winner. The former Avispa and Albirex defender misjudging a long ball over the top, to not only stumble in his attempted clearance, but to also send Ponte clear near the right edge of the box. The skilful Brazilian pulling the ball back for an easy finish for Haraguchi. Urawa continued to dominate the pace of the game, and their pressure kept our defence flustered for much of the time. Hosogai should have done better with a difficult volley after 20 minutes, but blasted over from 10 meters out. Edmilson also turned the usually sound Abe inside-out on the right flank set up a great chance, but under-hit his pass, allowing Chiyotanda to clear the danger. Sloppy play at the back allowed Yamada to fire in a powerful shot to force Narazaki into another fine save. We managed to pose the occasional threat though, with Josh looking good both in the air and on the ground. A late surge saw us dominate the closing minutes, but fail to get the vital goal that would have given us a respectable result. After a fairly even and intriguing first half, the Osakans skipped past the reigning j1 champs at Nagai Stadium this afternoon. The lackluster Antlers came out for the second half looking even lazier and more disinterested in the contest then they had in the first. At least in the first half it had looked like Cerezo's speed in closing down the ineffective midfield was what had prevented the champions from gaining the upper hand. The second half was a different story, and the home team was the only team that looked like winning. Gamba loanee Ienaga had already wasted a couple of good opportunities with a couple of unconvincing shots, before Shinji Kagawa showed how it should be done. Curling in a neat shot that beat the outwitted Sogahata, who flapped tamely at a shot he should really have tipped wide. The hapless keeper then capped generally poor performance by gifting Osaka the winner with his gormless distribution. Cerezo forward Amaral making no mistake after pouncing on the inept ball out of the area and firing past the stranded keeper. However, unlike last week's game, this was a good performance by the team, apart from the lack of finishing. We ran Yamagata ragged, and should have won far more comfortably than we did. THe only concern from the game was the loss of Kanazaki for what looks like a couple of games. The former Oita winger has been one of our most consistent player this season, and is likely to be missed against Urawa, as will the suspended Tulio. We will have to hope that Masukawa looks equally unflustered playing alongside Chiyotanda as he has with Tulio. We pressed forward from the opening whistle, and this helped lead to the opening goal. Nakamura closed-down and dispossessed a Yamagata player deep in their own half, Josh quickly pounced on the loose ball to release Mu into space in the area and the winger returned the compliment be sending in an inch-perfect cross to give the towering Aussie a simple nod home from three yards out. Tulio picked up his fourth yellow of the season after the ball struck his hand from a corner. It looked entirely accidental as his arms were entangled with those of his covering defender as they both jumped for the ball, but there is no doubt that the ball made contact with his elbow. This corner came as the result of a raking cross-field ball from the Brazilian-born defender that almost gave Josh another goal. However, the overstretched Montedio defence made just enough of a challenge to send the ball wide for the corner. The Yamagata defence continued to live dangerously, as a neat buildup saw　Hayuma knock the ball back for Tamada to tap home from close range, but the effort was ruled out for offside. Mu Kanazaki then sent a header wide after a neat pull-back from the bye-line from Tamada. The Japan forward then made a typically speedy burst into the box, but sent his powerful shot flashing wide. Meanwhile, the Montedio attack was limited to a couple of wild long-range shots. Alex also had another good game as one of the two defensive midfielders. His accurate crosses frequently had the blue and yellow line at full stretch and even managed to send in a trademark curling shot that flew just over the bar. Indeed both he and Naoshi were able to make frequent forays forward, such was our level of control during the half. Having spent most of the half desperately hanging on, the visitors got back into the game shortly before the interval. Kitamura turning on a sixpence in the six-yard box to send the ball past the wrong-footed Narazaki. The Japan custodian was then called into action again, as he was forced to tip over a strong Tashiro header. Montedio keeper Shimizu was called into action immediately in the half, as a shrewd Burzanovic pass sent Nakamura in with a clear sight of goal. The young keeper doing well to turn the midfielder’s angled shot round the post for a corner. Next, it as Kanazaki’s turn to go close, as his effort under close challenge went just wide. Unfortunately, the young winger was injured in his next surge forward, in which his neat pull-back for Nakamura was bundled wide by a defender. However, he hurt his right thigh in the process and is out for a couple of weeks. Ogawa coming on in his place. The loss of his co-tormentor down the right flank saw Hayuma struggle to be as influential in this half as he had been over the opening 45 minutes. As a result, it was Abe and Alex who started to look the more likely to stretch the Yamagata defence. As for our volante’s, both Alex and Naoshi continued to get forward, but failed to make a decisive break. Indeed, Alex was hardly needed in a defensive role, leaving those duties to the snapping Naoshi. On the other hand, Tamada was clearly reveling in the space that he was able to exploit in his withdrawn midfield position. Another typical surge through the middle again forcing Shimizu into a fine save as the Tamada’s shot looked destined to find the top left corner of his goal. Josh was also looking as though he was not feeling any effects from his recent back injury and was strong in the air and also able to make his surprisingly sharp turn on the ground, one of each saw him fire in another strong shot to test Shimizu. The Montedio defence often forced to resort to dubious means to try and keep the Aussie from getting in his powerful headers. As the game wore on and we still had not added to our tally, Tulio and Masukawa both made surges into the opposition ares, but could not find the composure to get a clean shot on goal. Manager Stojkovic was able to further bolster the attack, by bringing on Chiyotanda, which allowed Tulio to operate as an additional centre forward. Having seen Ogawa send a shot fizzing over from his neat pass, the big defender crashed home the winning goal after more neat work by Alex and Tamada.